When thinking of hockey’s greatest scorers, it is easy to overlook Dennis Maruk. Twice he put up 50 or more goals and was nearly a point-per-game player in his 14-year NHL career. But if you look at the sad-sack teams Maruk was doomed to play on — the California Golden Seals, the Cleveland Barons, the Minnesota North Stars and the Washington Capitals — it is easy to understand why Maruk is often forgotten. Three of the four teams he played on don’t even exist anymore, and the Capitals were so bad in the early 1980s that the team almost moved. 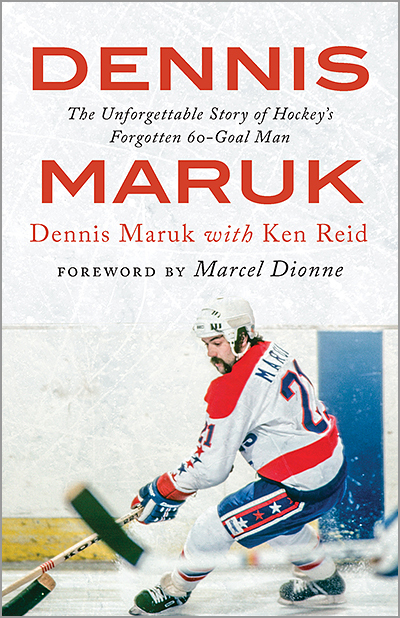 Perhaps it is the lack of press that Maruk got during his career that makes his new book, entitled “Dennis Maruk: The Unforgettable Story of Hockey’s Forgotten 60-Goal Man,” so appealing. 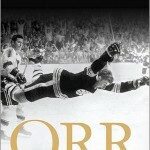 Thousands of words have been written about Bobby Orr’s Cup-clinching goal, but not so much about the feisty center with the Fu Manchu. 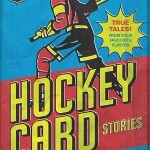 Maruk’s book is co-authored by SportsNet’s Ken Reid (“One Night Only,” “Hockey Card Stories“) and puts a much-deserved spotlight on Maruk’s stellar NHL career. Right away, Maruk addresses the elephant in the room — his famous Fu Manchu-style mustache that was his trademark.. He then goes chronologically throughout his career, sometimes jumping a bit ahead in his timeline when necessary. Maruk dreamed of playing in Toronto — first as a junior for the Marlboros , then the Maple Leafs if he could impress enough to get drafted by them. But destiny proved otherwise, as Gordie Howe, of all people, inadvertently scuttled Maruk’s plan to play for the Marlies. Three years later, Maruk would become, in his own words, a “hockey vagabond,” plying his trade in half-empty arenas in hockey doldrums like Oakland and Cleveland. Yet, Maruk was upbeat during most of his career, despite the constant setbacks. Reid dug up a few old articles that quote Maruk from back in the day and recount the brighter points in his career, such as his two All-Star Game appearances and capping off a 60-goal season in 1981-82. Like a lot of hockey player autobiographies, Maruk tends to gloss over the latter years of his career, when injuries and indifferent coaches limited his ice time. But those years tend to be the most interesting, as the player must cope with the reality that nothing lasts forever and have to figure out what comes next; this is usually a major turning point in a player’s life — and in the subsequent book about his life. More about the end of Maruk’s NHL career would have been welcome here. However, Maruk does freely share that he went to some very dark places once his hockey career ended. The fact that he is willing to open up and talk about his saddest, most vulnerable moments give another dimension to Maruk once we look past his 60-goal season and famous mustache. Excerpt that epitomizes “Dennis Maruk”: In the spring of 1982, I was a 60-goal man. Then I was told I was a left-winger. Then I was told I was traded. And now, in Minnesota, less than two years after scoring 60, I was fighting for ice-time. Welcome to my hockey career: I had to constantly prove myself. There was only one way to do it: play the game that I knew. One thing that I was not going to change in Minnesota was the way I played the game. Those valuable words, “Be a prick,” stuck with me. And in the mid-1980s, if an undersized forward people called Pee-Wee was going to survive, being a prick was an absolute necessity. 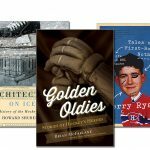 What I like about “Dennis Maruk”: We have all read about some of the best teams in history, but Maruk fills us in on what it was like to play for some of the worst — including one that held a “save the team” fundraiser! 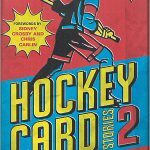 He also gives us a look at at the pro hockey lifestyle in the 1970s and 1980s, and isn’t afraid to call out those who stifled his career. 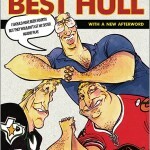 What I do not like about “Dennis Maruk”: Honestly, I wanted a bit more about the bad years at the end of his career. Also, the book has 60 — get it? — short chapters, with many being around two pages long. There is nothing wrong with that stylistic choice by the authors, but sometimes it felt like the scene kept changing too quickly. Thanks for reviewing this book, I have been meaning to pick it up, seems like an interesting read!